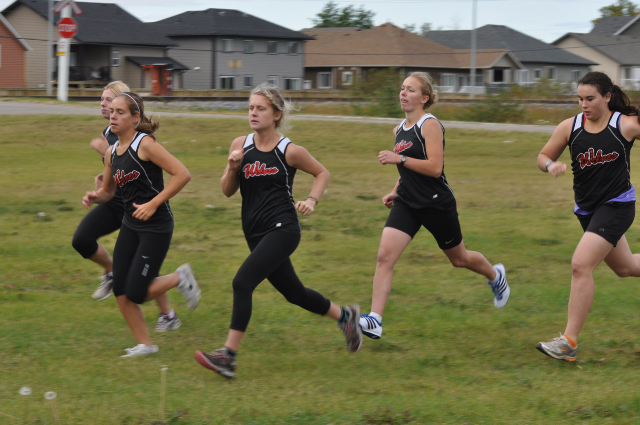 With two weeks to go before the ACAC Championships, the Wolves x-country running teams are rounding into top form. Both teams had season’s best placings on Saturday in ACAC Grand Prix #5 – the Augustana Open in Camrose. The men were again led by Devin Woodland who placed third amongst the college runners, his third ACAC podium placing this fall. Woodland clocked a time of 28:34 for the challenging 8 km course. Rookie runners Jack Carrigan and Duncan Farrow were the next GPRC runners, placing 20th and 24th respectively in their first ACAC race. Torlief Lansgaard (49th), Evan Paul (50th) and Bjorn Carlstad (53rd) were the other Wolves runners recording a placing. Overall, the men placed fifth, behind the victorious Lethbridge College. Thirteen Wolves women, the most ever entered in a ACAC race, toed the line in the womens 5 km event. Maddy Clough led the way for GPRC with a ninth place finish. Following Clough, were Lena Farrow (20th), Kaya Hardy (24th), Davis Alton (38th), Chassity Mohan (39th), Vanessa Besharah(44th), Carinal Ness (46th), Calla Scott (26:11), Linnea Saltel (54th), Erin Corcoran (58th), Hannah Tighe (64th), Alison Hodgins (66th), and Carly Upshall (68th). Next up for the x-c Wolves is the Wolves Alumni X-C Relay on Saturday at the Wapiti NordicSki Trails. This entry was posted in Cross Country, Uncategorized and tagged ACAC, Augustana Faculty, Camrose, Cross Country Running, GPRC Wolves, GPRC Wolves X-C Running, Grande Prairie Alberta, Running. Bookmark the permalink.